Inman is interviewing office managers. Here’s Lisa Hansmeier, director of operations at Coldwell Banker At Your Service Realty. What sets your brokerage apart? We are 100 percent family here. We really all love each other and have so much fun together. The owners, Jim and Diane, have a very selective screening process, and in turn everyone who works here is just plain fun to be around. Our motto is “do the right thing.” I know what you’re thinking … uh, whose isn’t? Honestly, though, those colors run very true within our walls. I have seen our owners fire top producers because their morals or ethics were not in line with our business philosophy. I have also seen Jim and Diane turn down top-producing agents wishing to transfer to our company for the same reason. I have also seen hundreds of checks written just to make a client happy — many times when it was not even our check to write. Our company probably could be twice the size with double the profits, but at what cost? Walk us through a day in your life. What is the first thing you do when you get into the office and the last thing you do before you leave? What happens in between? The first thing I do when I get into the office is get coffee. Then I get caught up with email and any work that came in from the agents overnight or over the weekend and update leads. Then much of the day is tending to the agents’ requests as they come in, whether it be a sale to process, new listing, commission check to process, troubleshooting, software support and so on. We assist our agents with any and all requests. You probably won’t catch us picking up their dry cleaning, but we know the ins and outs of our office and association programs and systems very well so we are pretty darn invaluable to our agents. Well, at least we like to think so. We are even able to fix most computer issues before calling in our IT support company. My favorite part of the day is just being around all of the great personalities we have in this building. I can’t stand dealing with people from other real estate companies or title companies who act like you are a bother or a nuisance — hey, we are all in this together, right? What does lunchtime look like for you — do you leave the office for lunch or eat a brown-bag at your desk? Lunch is usually in a brown bag, but we are often very easily persuaded to get takeout. How do you support your agents after hours and on weekends? The agents are pretty well-organized, and we really do not need be of much assistance on the weekends or after hours, but they do know that in an urgent situation, one of us is always willing and able to come to the rescue. Have you ever managed an office outside of the real estate industry? How did you make the transition to real estate? I started as an administrative assistant at this company 13 years ago. I have slowly moved my way up to office manager, then director of operations. How many agents work out of the office you manage? One primary broker, though we do have two other acting brokers. How many listings does your office manage at any given time? Anywhere from 100 to 300, but because southeast Minnesota (as well as many other parts of the county) is in the middle of a major listing drought, we are actually even below that right now. Great news for sellers! We have a “ranch style”-looking office. The main goal when the owner and co-owner were designing the office was to make it look and feel like home. While touring our office, you will find warm colors, cozy lighting, built-ins, cherry accents and happy, upbeat agents. You will rarely ever see a closed office door. What is the floor plan like? 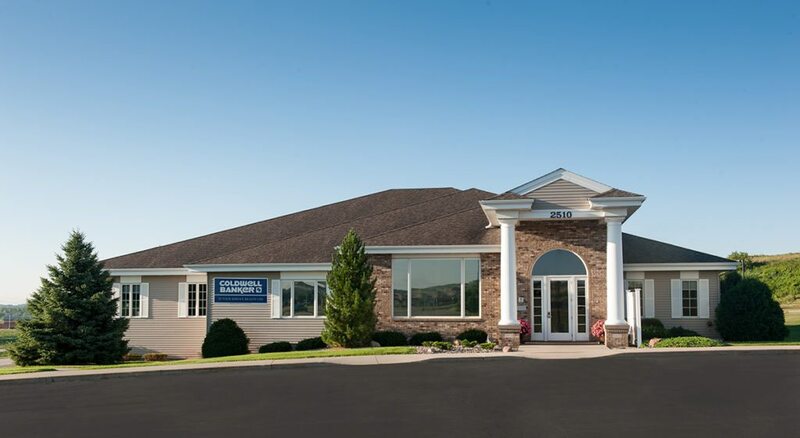 Coldwell Banker At Your Service owns the building, so that takes up most of the space, but we do have other office suites including title and escrow, insurance and mortgage. One-stop shop! What is the décor like? Lots of rich colors; greens, browns, reds, blues. The owners have very good taste, so everywhere you look you will see that no expense was spared or detail was overlooked. What CRM does your office use? What email system does your office use? It is a Gmail/Outlook war in our building; to each their own. We do not mandate email service. Do you have a live person answer your phones, a messaging service or some other way to manage phone calls? As long as I am around you will always get a live person on the other end when calling our office. That is the only way to do it as far as we are concerned. Do you have any office manager assistants, or are you doing it all yourself? If so, how many and how do they support you? We have an awesome team of four: Jim and Diane (owners) and two office support staff (myself and Bailey.) We all work together to make sure our agents are happy. Are you involved in the social media strategy? I, along with one other person, take care of all of the social media. Have you ever sold real estate? If not, do you have any interest in selling real estate yourself? I have never sold real estate. At this time, I would not have any interest in selling. My kids are little and my nights and weekends are spent with them and my husband. That time is sacred. Would you recommend this career to someone else? Absolutely! I have built so many great friendships and learned so much about this business in 13 years. Every single day is different, and you really never know what your day will bring. It is like starting a new job every day. What has been the biggest change to your job over the past year? Technology — keeping up with technology requires a lot of effort and is an absolute necessity. If you were forced to work in any industry other that real estate, which would it be and why? Own a fishing charter business or own a marina or something like that. Anything that would allow me to be next to the water all day. Are you involved in any technology investment systems? Yes, mostly all of them. Do agents rely too much on you to handle things? Maybe sometimes, but we honestly want it that way. We want to be able to take care of as much of the minutiae as possible so that the agents can be out there selling their listings and finding new buyers. To what extent do you help with closings? What broker or agent habits drive you crazy? Sometimes we make ourselves a little too available, and sometimes when we can’t drop everything, it is a surprise to some of the agents. Oh, well — it does not happen that often. If you had a magic wand that would grant one wish related to your job, what would it be? Are you an office manager who’d like to participate in our profile series? Email amber@inman.com.